Scott Cole is one of the newer Bizarro writers on the horizon. His SuperGhost was one of the big surprises for me in 2015. In that novel, he exhibited a strange but accessible humor along with an almost casual sense of the bizarre and impossible. 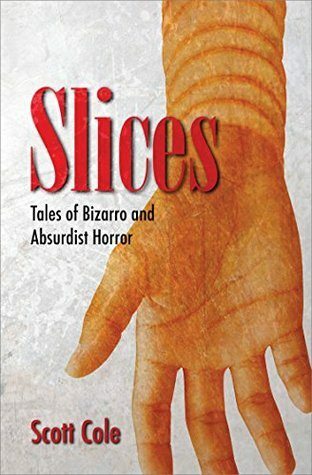 In Slices: Tales of Bizarro and Absurdist Horror he does the same with 33 brief stories. Most qualify as flash fiction, while a few go on for slightly longer. They can all be called surreal or bizarro and they all delve into impossible scenarios. (Except for “Rough Night” which accurately describes how I feel most mornings.) The most distinctive thing about Slices is that these tales are more horror related than that of SuperGhost. Many dwell on biological transformation or what is known as Body Horror. In fact, there are a lot of exploding body parts. I think it may be a Cole trademark. The best one-word description of a Scott Cole short fiction work is “mindblowing.” No matter how short or long, he usually captures you with the first sentence, like the one at the beginning of this review which is from “Landau Made Some Mistakes.” You are pretty much hooked from there in. Some stories are straight on surrealism as is the first story, “The Degenerates.” Others like “Violins for Sale” resemble more of a normal horror story, with “normal” being a relative term. While I find the flash fiction exhilarating, I am more drawn to the slightly longer stories like “Cat Tree Summer,” “A Field of Poppies,” and “666 Baby Jesuses, Give and Take,” a story that should appeal to anyone who have ever had the collector bug. But if you go for a more visceral and uncomfortable type of horror, you should not miss “Slices of Me,” where a man is determined to share his delicious flesh with the world. I like the writings of Scott Cole because he always surprises. In this case, we have 33 little surprises. If I had to compare this book to anything else I might call it a horror version of Italo Calvino’s CosmicComics. If I had to issue a warning, it would be that some of the biological horror may be a little too much for sensitive stomachs. The author has a way of making the horrific both scary and amusing. It’s a trick I hope he holds on to. Overall, Slices is a nice introduction to a very imaginative, if weird, mind.